We are looking for an enthusiastic, hardworking young biologist to work as a voluntary Research Assistant to help with our pelagic seabird research on Skomer Island, Pembrokeshire, Wales, in Spring and Summer 2014. The work will involve several research projects coordinated by Prof Tim Guilford at Oxford’s Department of Zoology (see the OxNav website). We utilise state-of-the art tracking technologies (miniature GPS, geolocators, time-depth recorders & on-board video) on several species (Manx Shearwaters, Atlantic Puffins, Common Guillemots, Razorbills). 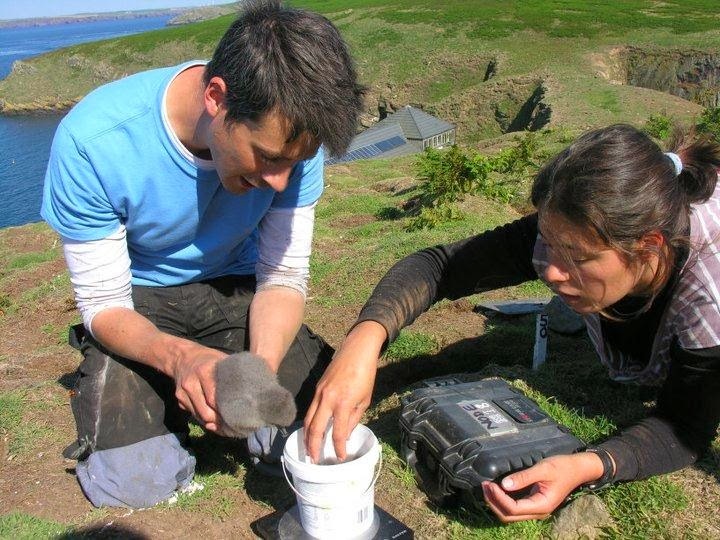 Most work will involve assisting three doctoral students with the day-to-day maintenance of the study burrows, weighing and monitoring breeding birds and their chicks, and the deployment and retrieval/downloading of tracking devices. It will also involve entering data collected in the field into appropriate databases. There will be a significant amount of nocturnal work, since the primary study species is the Manx Shearwater, which only arrives at the colony after dark. There will also be scope for involvement in other conservation and ecological projects on the island, which is a National Nature Reserve administered by the Wildlife Trust of South and West Wales. 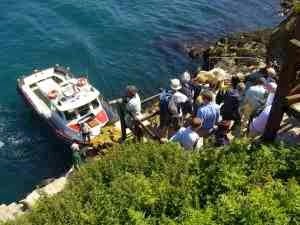 Unfortunately we cannot provide a stipend but accommodation (shared and basic) on Skomer will be covered. However, the project is a great opportunity to gain valuable experience in modern field ornithology. There will also be opportunities for the assistant to learn some analytical techniques applied to animal movement data. Skomer has mobile coverage and some access to Internet, however movements to and from the mainland are limited because of unpredictable wind conditions. There is a small community of wardens, assistants and volunteers, who are involved in the running and conservation of the Nature Reserve, monitoring the seabird populations, and managing the daily and over-night visitors. There might be opportunities to visit other UK island reserves during the project. Profile: we are looking for a motivated and hardworking biologist, who likes working in the field and can cope with difficult working and living conditions. Previous experience in the field or in harsh conditions is desirable, but not essential. Work on Skomer requires long hours (with some work at night and at dawn) spent in a cold and wet environment and considerable manual work. A good candidate should be able to work independently and have a reasonable level of fitness. Planning to embark on further research degrees in the future would be a plus (previous assistants have engaged in doctoral studies afterwards). It is also important that the assistant feels comfortable sharing sometimes crowded accommodation with a number of colleagues over long periods of time, and can cope with the occasional untidiness inevitably associated with fieldwork. Unfortunately, for administrative reasons, we can only accept applications from people having permission to work in the UK (UK and EU citizens, UK residents, or persons with a UK work permit). We are looking for an assistant to work with us between April and September 2014. If you are interested, please email a CV and a statement of interest and arrange for two letters of reference to be emailed to tim.guilford@zoo.ox.ac.uk (with oliver.padget@zoo.ox.ac.uk in cc). The deadline for submitting applications (including reference letters) is the 14th February 2014. We will interview the shortlisted candidates (on Skype) shortly after and we expect to make a decision by early March. The deadline for this post has been extended. Please see below for new details. We are currently recruiting for a new post on Skomer Island. 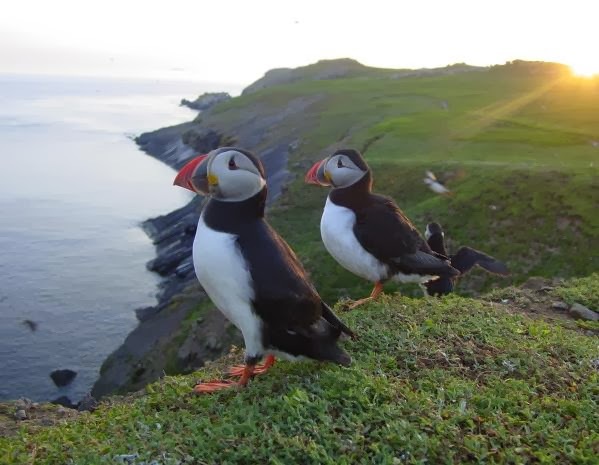 The post, Skomer Visitor Officer, will be a permanent post based on this flagship nature reserve for around nine months of the year, and on the mainland for the remainder. It is a very visitor-focussed post and requires a candidate with exceptional inter-personal and visitor engagement skills, whose time will be focussed on developing and marketing the visitor experience on the island, as well as the day-to-day management of overnight guests and promotion of the island as a conservation destination. Download the job description and application form here. Please note that applications made using CVs and covering letters will not be considered. The new closing date is Friday January 31st. If you have not heard from us by February 7th please assume that your application has been unsuccessful. Interviews will now be held on Thursday February 13th 2014. Please note that we are unable to pay travel expenses for interviewees. Skomer Island Recruitment, WTSWW, Welsh Wildlife Centre, Cilgerran, Cardigan SA43 2TB.